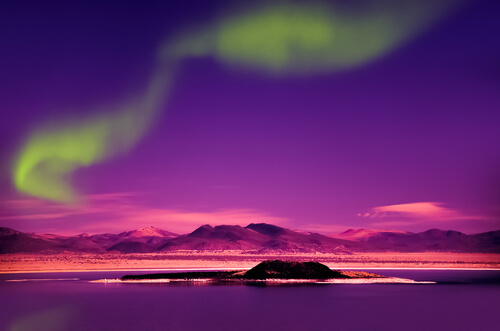 Aurora borealis or the Northern Lights as they are known, are one of planet earth’s magical wonders. Waves of bright colours – greens, pinks or perhaps blues and reds – emit an eerie glow of light in the winter sky. They may appear as laser beams shooting across the sky like a battle in a sci-fi movie or like rivers of light flowing up into the sky. They may appear like scattered cloud, dancing in the night breeze or like a vast sky-colour curtain being pulled open. A tear in the sky, a blotch on the night, whatever their colour and shape, if you’re lucky enough to see these natural phenomena then it is something you’ll never forget. The Northern Lights are created when gas particles from earth collide with charged particles from the sun. The sun’s powerful energy is usually refracted away from earth due to its powerful magnetic field but at both the North and South poles, where the magnetic field is weaker, the solar winds break through, colliding with our natural gasses causing these colourful explosions. Different types of gas particles in the air create different colours in the sky. Most common is the green colour created by the collision of oxygen particles that are found around 100km above earth. Nitrogen particles produce a blueish purple aura and the collision of very high-altitude oxygen, at around 300km above earth, creates a red colour. Green is the most common of colours, with the blues, yellows and purples also often visible. The burning red colour, the rarest of them all is not often seen because of the high altitude in which it is created. When viewed from space the Aurora looks like a giant green crown sitting on top of the Arctic Circle with red gems sparkling on top. Where is the best place to see them? The north coast of Norway is arguably the best place in the world to see the Northern Lights. This is because Norway sits below the ‘Auroral Oval’. The Oval almost follows the line of the Arctic Circle, the ring that encircles the North Pole at a distance of 2,600km. Although it is said that you should be above 55 degrees north to witness them clearly, the Lights have been spotted much further south. In fact, during a couple of seriously strong solar flares last century they were spotted as far south as Hawaii. Most expeditions to see the lights might involve a journey, on foot, by car, snowmobile or boat to the highest, darkest or most remote area possible but whether you’re keen to see the Lights from sea, from up high, or from within a forest, there are options for everyone. Lapland, Lofoten, Tromsø and the North Cape are some of the best places to witness the Lights on the Arctic Circle. The remoteness of these areas, and therefore the lack of light pollution, combined with the long dark winters that make them seem to glow even more brightly. 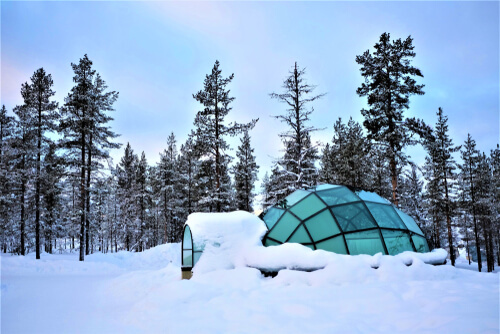 Lapland is the home of the Sami people and here, in the north of Finland, you can stay in one of the many igloos with clear roofs that allow you to stare up at the sky from the comfort of your bed. The North Cape is the mostly northerly point of Europe. 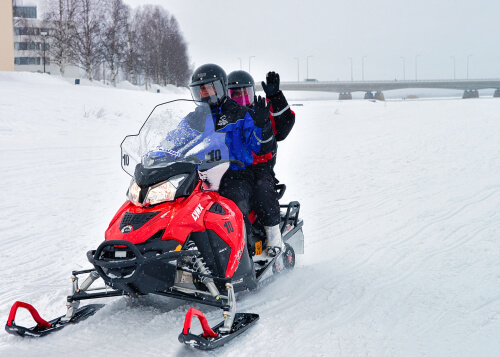 The hardiest of Arctic explorers can travel out by snowmobile to try to catch a glimpse of the lights from the top of the cliffs overlooking the Barents Sea. Tromsø, above the Arctic Circle and right on the Atlantic coast is another popular spot to see the lights. Tromsø is nestled among the forests and fjords of the west coast of Norway, presenting nature’s true intended backdrop. Or try Norway’s archipelago of Lofoten the most westerly point of Norway, where just a finger of land points out towards the Atlantic. Fishing villages leap out from the dark thanks to the brightly painted, old wooden houses that house fisherman who have lived under this magical light show for centuries. The dramatic scenery of Lofoten, with jagged pinnacles reaching up to the sky, is a sight in and of itself. Although it is impossible to predict when the Lights will show, there is a higher chance of seeing them during the dark cold winter nights, between October to March, from 6pm and 1am but they are as changeable as the weather so there is no guarantee that they will be on display. Scientists do know that the is a link between the solar flares and the Lights. When there is an increase solar activity and solar flares are stronger the more likely they are to collide with earth’s molecules and therefore the brighter the exploding light will be. A peak sun spot cycle will occur at the end of 2019 with the next one occurring in 2024 making the probability of seeing them then significantly higher. So wrap up warm, grab a hot berry juice and prepare to be marvelled.